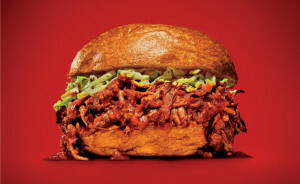 Home » Meat » SLOPPY JOE TONIGHT! So tell me, who is the Joe and why is he so sloppy? The best answer that I could find was that the concept of a Sloppy Joe as a sandwich originated in 1930 in Sioux City, Iowa, in a small local cafe as a loose meat sandwich, courtesy of their cook, a guy named Joe. Seriously, I really couldn’t find any other explanation. Cold weather makes Sloppy Joe the perfect recipe for a quick dinner after work or a lazy Sunday afternoon. As for the recipes, the classic ones typically have ground beef, onions, ketchup, seasoning and a few other ingredients in them. Nice, simple and tasty. However the following recipes are just a little bit different and beyond delicious. I also have a few suggestions to make your Sloppy Joe extra special. 1. Serve them with shredded lettuce, sliced tomato, avocado and pickles. NOTE: Most classic Sloppy Joe recipes call for Worcestershire Sauce. Most Worcestershire sauce, while kosher, does contain fish and therefore is not recommended to be served with meat. I always substitute soy sauce for it in recipes that have meat in them. In a large skillet brown the ground beef, onions and garlic. When the meat is no longer pink, drain it then put it in the crock pot. Add the salt, and black pepper, water, soy sauce, mustard, brown sugar, ketchup and barbeque sauce. Mix to combine. Cover and cook on low for 4-5 hours. Serves 10. In a large skillet heat the oil then add the onion and garlic. Saute 2 to 3 minutes then add the turkey. Cook, stirring constantly, until the turkey is no longer pink, about 5 to 7 minutes. Drain and then add the rice, water, ketchup, tomato paste, vinegar and brown sugar. Bring to a boil, then lower the heat to a simmer and cook until hot throughout. Serve on buns, makes 8 to 10. In a skillet heat the oil and then saute the onion, pepper and celery. Cook, stirring occasionally for about 5 minutes. Add the cumin and chili powder, mix to combine and cook for 1 minute. Add the lentils, water, tomato sauce, tomato paste and hot sauce. Bring then mixture to a boil then reduce to a simmer. Cook, uncovered, for about 30 minutes, stirring occasionally. (Add more water if the liquid gets too low, below the lentils). At this point, taste the lentils, and if they are tender add the salt and balsamic vinegar to taste. Serve with your favorite topping on the buns. Serves 6.